Mia is perfectly styled in this little black dress. A gal just can’t have too many! This bell-sleeved crochet mini dress was a great find. It was new with tags from the Xhilaration brand and priced at a smart $7.99! With a LBD, you can accessorize to your hearts content. Here I used a cameo ribbon choker from a DIY project I did last year. It looks great with the neckline of this dress and adds a certain vintage feel. The designer inspired pumps add a little interest here too, as they make their own statement. These kitten heels are by G Fresh and were priced at $6.99. So, you can see here a simple black dress, plus unique accessories make fantastic fashion, and Goodwill makes it affordable to experiment with your personal style! Chris looks fresh and bright with this casual fun look for April. Classic pieces mixed together always make for a great fashion statement as you can see here. 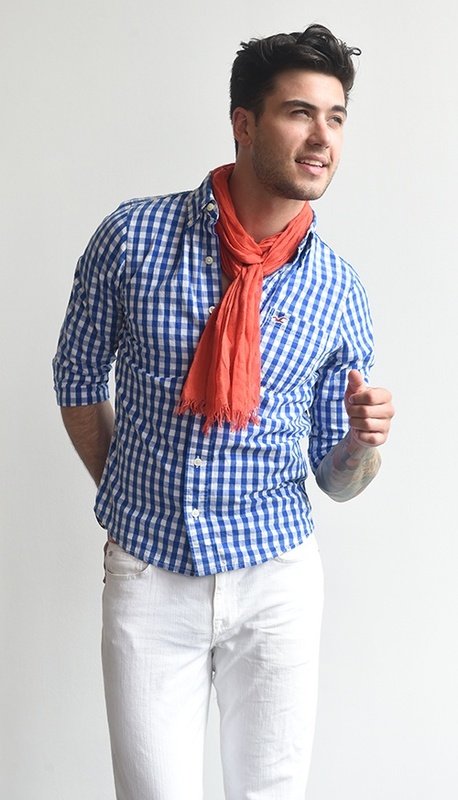 The star of this show is the gingham check button down shirt, in blue and white from American Eagle for $4.99. But, a great supporting player for the warm sunny days ahead are the white jeans from Levi’s priced at $7.99. These two items can be worn numerous ways throughout the season, so they’re a great buy for any guy looking for an instant fashion upgrade. We added some accessories too, including a great oversized watch with red band that was $9.99, a coral scarf for $2.99, red belt for $1.99, and his own Keds brand deck shoes in navy and white. Having a few pieces that are summer favorites can make all the style difference!